On Tuesday 7 November, Wittenborg University of Applied Sciences will say goodbye to Indonesia after spending a packed week visiting high schools and education fairs, meeting educators, agents and officials in various parts of the country. We even met up with some of our Indonesian alumni, like Agung Gani, who helped man the Wittenborg booth at the European Higher Education Fair in Jakarta this weekend! Wittenborg was represented by senior admissions officer, Florian Oosterberg who flew to Indonesia almost two weeks ago. First stop was Surabaya - a port city on the Indonesian island of Java where the first Dutch Placement Days (DPD) took place. The DPD were organised by Neso Indonesia. Here Florian gave a presentation and also spoke to prospective students, helping them fill out application forms and answering all questions about studying at Wittenborg and in the Netherlands. She also met up with various education officials who attended the fair. Among them was Peter van Tuijl, director of Neso Indonesia, as well as Marrik Bellen, former director of Neso China. 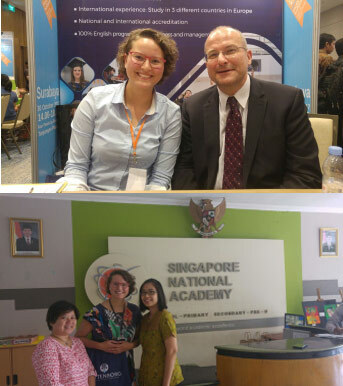 In between, Florian managed to visit high schools, such as the Cita Hati High School where she met with Patrick Nieuwenhuyzen, head of the English department at the school, which is well-known in the city. She also visited the Singapore National Academy, a high school that teaches Cambridge curriculum, meeting school counselor Judith Angelina and academic counselor Silvia Arista. Another agency she visited was Optimal Education, which has not yet sent any students to the Netherlands, but is looking forward to working with Wittenborg. Then it was off to Jakarta for another round of Dutch Placement Days in Erasmushuys – situated next to the Dutch embassy. 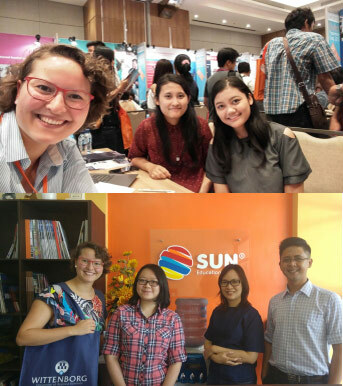 On 4 and 5 November, Florian attends the European Higher Education Fairs Jakarta (EHEF) before flying home on Tuesday.